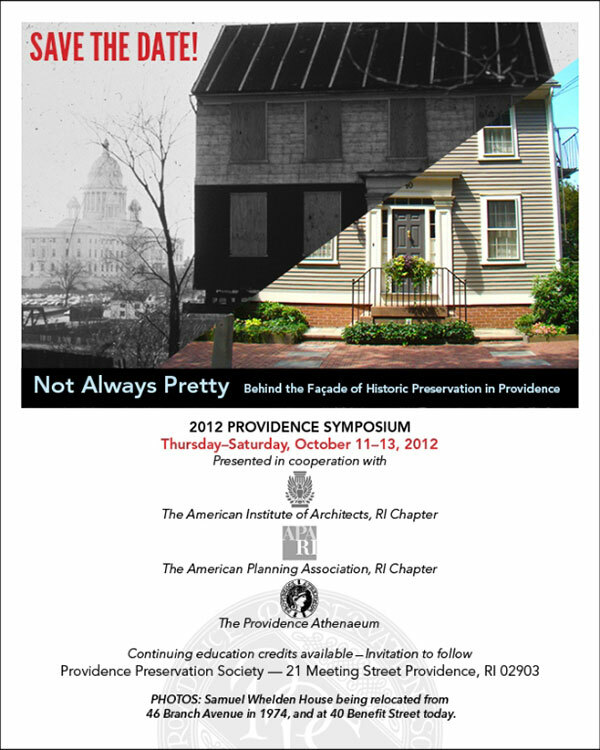 Building on the success of last year’s Providence Symposium, Make no Little Plans, The Providence Preservation Society will convene a diverse group of speakers to examine the Historic Preservation movement’s past and future in Providence with the 2012 Symposium, Not Always Pretty: Behind the Façade of Historic Preservation. The unparalleled beauty of Providence’s restored streetscapes masks a movement that has often relied upon unusual politics, uncomfortable compromises, and unpredictable alliances. As the idea of preservation in Providence has matured, so have our practices. We have often celebrated the “who” of Preservation, but the “why” and the “how” tell a much more nuanced, complicated, and sometimes less “pretty” story. Our morning sessions on Friday, October 12, will look at early successes (even pre-PPS) and the learning curve that arced from the rescuing of Benefit Street to the American Screw Works fire to the first adaptive re-use projects. In the afternoon, developers, planners, and historians will speculate and spar, and examine their crystal balls to predict where we could and should be going for our next 50 years, and what our strategies should be to get us there! Does Brutalism have a future? Who’s history is this anyway? How much preservation is too much? Join us and find out! Become part of this conversation which will help define tomorrow’s Providence!